Colombo, Sri Lanka – The three men at the heart of Sri Lanka’s weeks-long power struggle have held direct talks for the first time since the crisis erupted, but their meeting failed to reach a breakthrough, according to officials. President Maithripala Sirisena called for the talks days after several parliamentary votes on a no-confidence motion against his newly appointed Prime Minister Mahinda Rajapaksa descended into chaos, with angry politicians hurling chilli paste, chairs and books at legislators backing Ranil Wickremsinghe, the deposed leader. 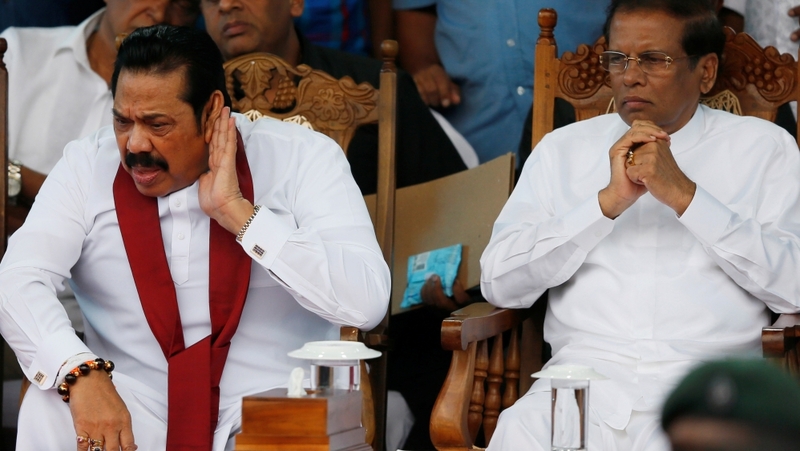 Joined by members of their parties, the president and the two rival prime ministers met on Sunday for more than two hours at the president’s office in the capital, Colombo, but did not appear to shift from their previous positions on the no-confidence vote. Both Sirisena and Rajapaksa have rejected the outcome of the voice votes, in which 122 legislators in the the 225-member House voted against the latter, claiming the speaker had failed to follow proper procedures. Speaking to reporters after Sunday’s meeting, Lakshman Kiriella, a legislator from Wickremesinghe’s United National Party (UNP), said the party told the president “we can show majority again”, but he “showed no interest”. Sirisena, in a statement after the meeting, said he would only accept a no-confidence motion if a vote was “taken by name of members or by electronic voting”. He also said all parties had agreed that future parliamentary proceedings will be “conducted peacefully”. Harsha de Silva, another UNP lesgislator, in a post on Twitter said Sirisena was giving “lame excuses of procedure” to “drag impasse along”. A source close to the president said Sirisena, who has repeatedly pledged not to accept Wickremesinghe as prime minister again, was “frosty” towards the deposed leader, but cordial to others. The tensions boiled over on October 26, when Sirisena fired Wickremesinghe in a move widely denounced as unconstitutional, and replaced him with Rajapaksa, a controversial former president accused of corruption and human rights abuses. Namal Rajapaksa, the former president’s son and a legislator, in a Twitter post on Sunday said he was “disappointed” that talks had ended inconclusively. Chandani Kirinde, a Colombo-based journalist, said she believes Sirisena’s strategy was to “drag this on till December 7, hoping the Supreme Court upholds the dissolution of parliament”. Rajith Keerthi Tennakoon, a Colombo-based political analyst, said the leaders’ failure to break the stalemate on Sunday showed that the gulf between the opposing sides had “only widened”. “Both sides are not in a position to back down, with the president insisting that due process had not been followed in presenting the no-confidence motions – this shows that he is not ready to appoint Wickremesinghe as prime minister,” he said. Asanga Welikala, a Sri Lankan law professor at the University of Edinburgh, blamed the talks’ failure on Sirisena, saying the president “seems to be totally oblivious to the massive damage” he was doing to Sri Lanka because of his “personal issues” with Wickremesinghe. The protracted crisis was straining the country’s struggling economy, affecting tourism and foreign aid, he said. “The president has repeatedly violated the constitution, and so far he’s refusing to be checked by parliament or moderate his behaviour in the face of a rebuke by the Supreme Court,” Welikala said, warning that Sirisena’s actions were “disastrous” for the country’s democracy.